From this block you can learn the full process of installing CrocoBlock products. Note, that after the theme is installed the Home page and the number of existing pages will differ from the ones shown on live demo. The full list of pre-styled pages and sections for Kava theme is available in Magic Button > Pages. Please, install JetThemeCore plugin in order to be able to add the pages manually. This block describes the detailed process of installing CrocoBlock products from scratch when one needs to install Kava theme as well as Jet plugins set and demo content. 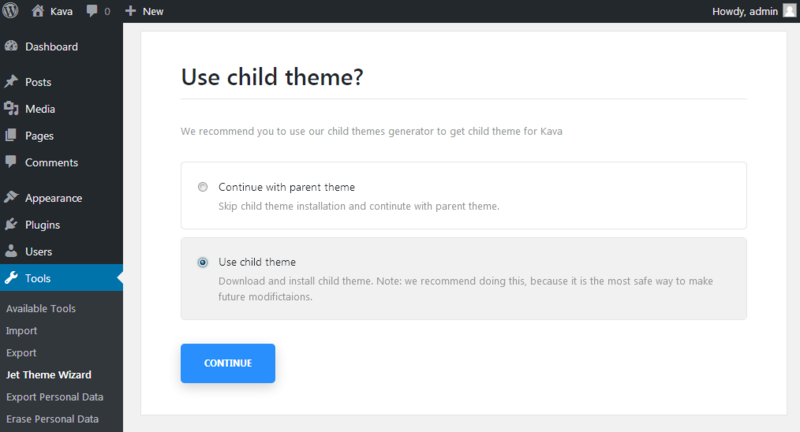 In the case You want to install and use both Kava theme together with Jet plugins pack and demo content, feel free to follow the steps described below. First, let’s install JetThemeWizard plugin. It is available for download in your Downloads block located in the client's account. To install it, please, open WordPress Dashboard and here navigate to Plugins > Add New. Click Upload Plugin button and then browse jet-theme-wizard.zip package on your hard drive. Click Install button and the plugin will be installed on your site. Then click Activate option to activate it. 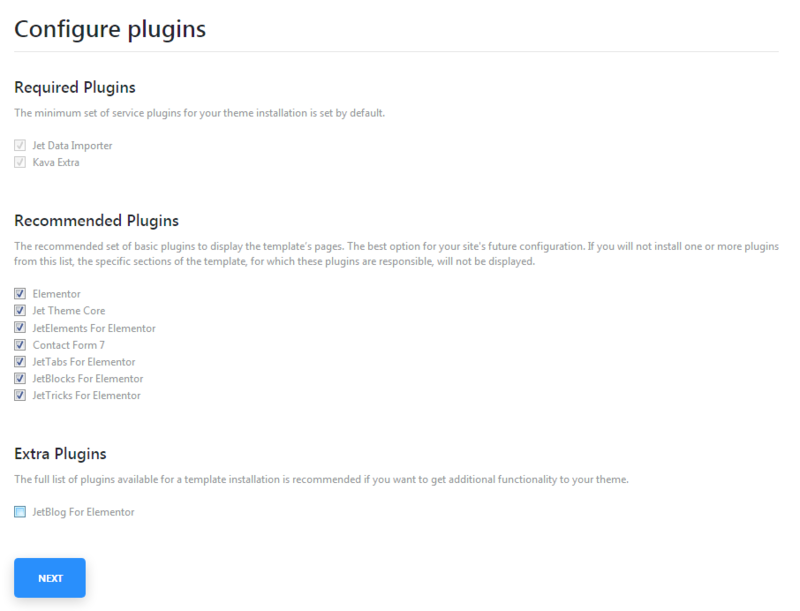 JetThemeWizard plugin allows installing the theme with all the needed plugins and skins smoothly in a step-by-step way. When it is active, you'll see Install Theme block where you need to paste the license key for the CrocoBlock subscription. After this, you'll see Use Child Theme? block where one can decide if he wants to install the parent theme only, or to install the Child theme along with the parent theme in order to make all the changes in CSS safe at all times. Click Continue button when you've made a choice. Select Skin and Start Install block allows selecting the skin and installing it for the theme with all the plugins and demo content. One can skip the demo content installation if needed later. Select the needed skin from the skins grid and click Start Install below it to proceed to its installation. 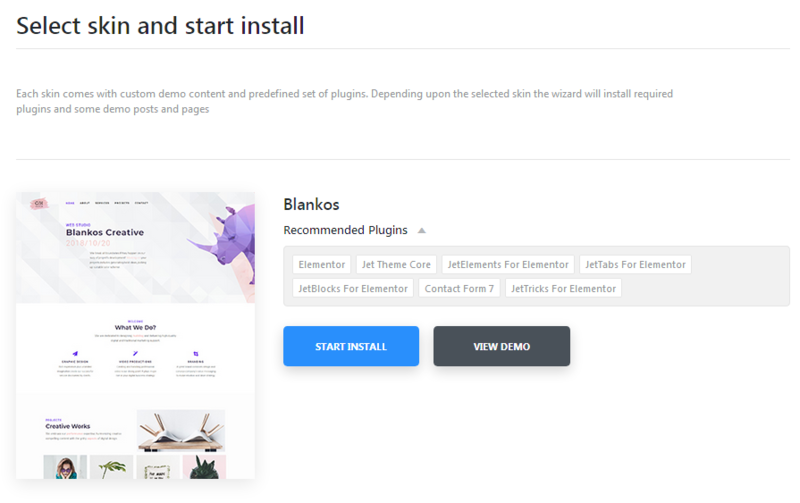 After you’ve picked the demo you want to install, Jet Plugin Wizard will open Configure Plugins page, which displays the lists of Required Plugins, Recommended Plugins and Extra Plugins. 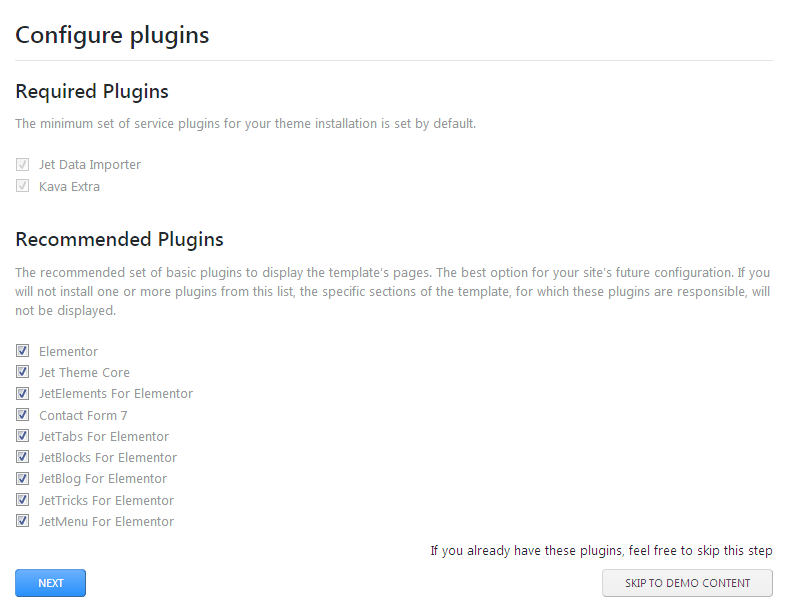 Required Plugins - here you can find the minimum set of service plugins for your theme installation set by default. Recommended Plugins - here you can see the recommended set of basic plugins to display the template’s pages. The best option for your site's future configuration. If you will not install one or more plugins from this list, the specific sections of the template, for which these plugins are responsible, will not be displayed. Extra Plugins - here one can view the full list of plugins available for a template installation is recommended if you want to add additional functionality to your theme. Check or uncheck the plugins from the represented list in order to select which ones you want to be installed on your site. After that click Next button. The installation process will start. In the case you already have the needed plugins, click Skip to demo content button to skip this step and start demo content installation. When the plugins are installed the green notices will appear informing you that the plugins are already installed and active on your site. The blue progress bar will show how long it will take to install all the selected plugins. 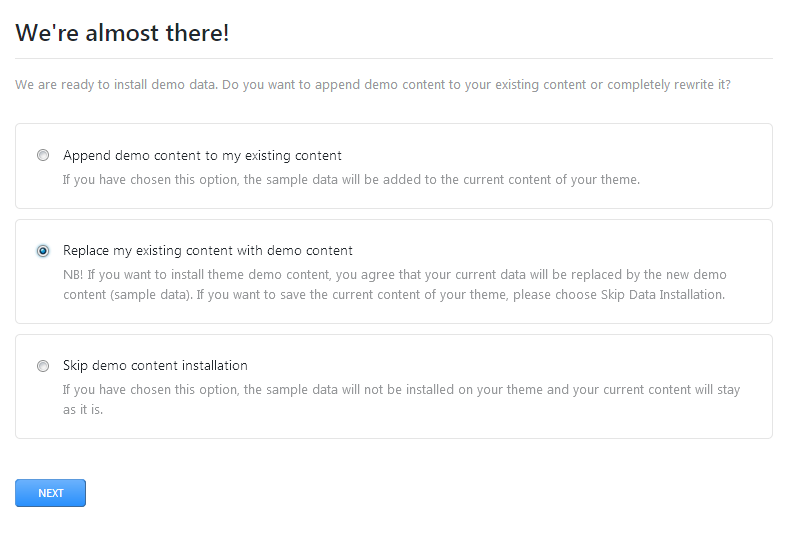 Append demo content to my existing content - the sample data will be added to the current content of your theme. 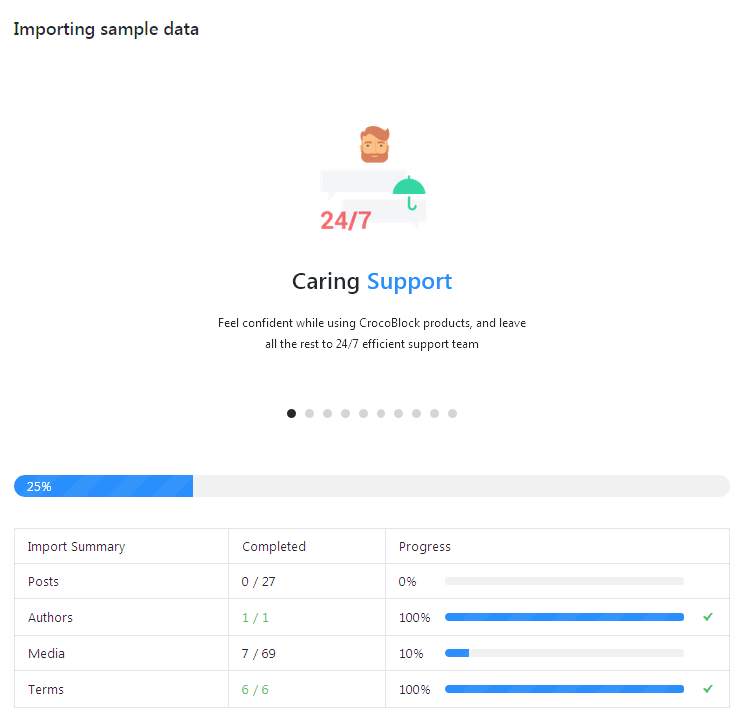 Replace my existing content with demo content - your current data will be replaced by the new demo content (sample data). If you want to save the current content of your theme, please choose Skip Data Installation. 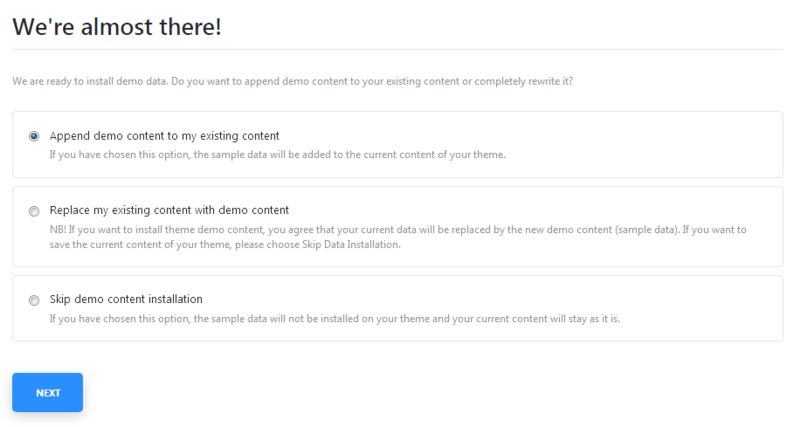 Skip demo content installation - the sample data will not be installed on your theme and your current content will stay as it is. After you’ve chosen the most suitable option, click Next button. The demo content will be automatically installed on your site. The blue progress bars will indicate the percents of demo content which are accomplished. This block uncovers the process of installing demos and plugins using Jet Wizard plugin. Please, read further in the case you want to use another theme instead of Kava. First, let’s install Jet Plugins Wizard plugin. In order to do this, open Plugins > Add New and here click Upload Plugin button at the top of the screen. Browse the Jet Plugins Wizard plugin’s .zip package, which you can download from your personal account. It is located right along with Kava theme in the Quick Installation Pack block. Click Install Now button. After the plugin is successfully installed click Activate link which is located right under the notice about plugin’s successful installation. Let’s activate CrocoBlock subscription. To do it one needs to retrieve the License Key. You can find it on your Personal Account page in Purchase Details block. Click Manage License link located under the License Keys. Here you’ll see your license details. You need to copy the key from the License block. Please, make sure that you have copied it without any extra text which can be also shown in this field. Let’s navigate to Plugins Wizard tab on the left of the Dashboard. 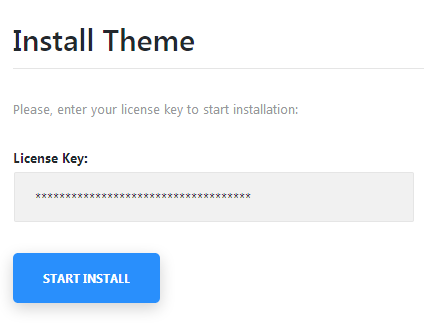 Here You’ll see the Installation Wizard page where one needs to paste the key in order to activate the license. Then click Activate License button. When the license is active you’ll be able to proceed to plugins and demo content installation right away. 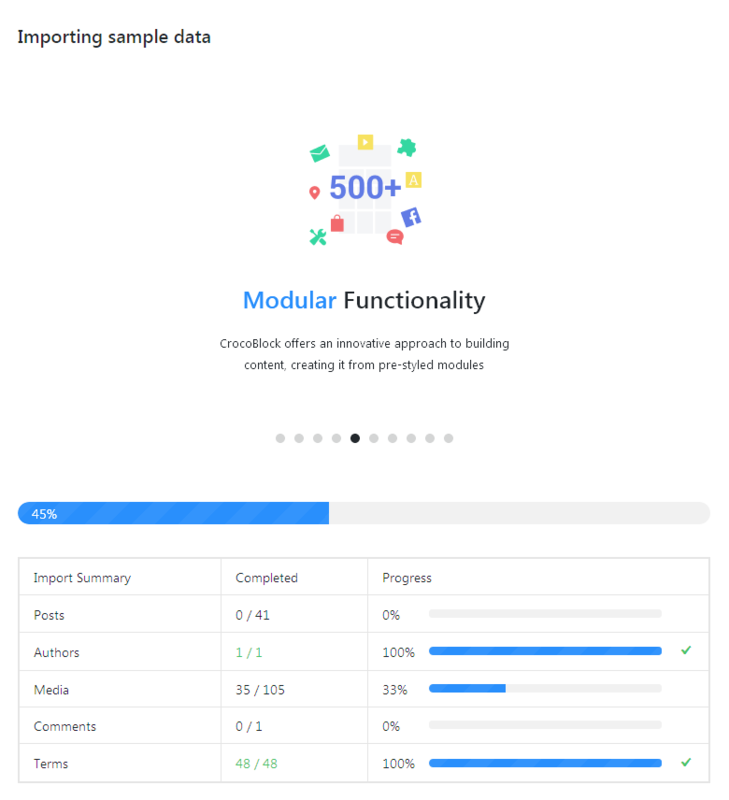 Let’s choose the demo you want to use on your site. To do it navigate to Plugins Wizard in WordPress Dashboard. 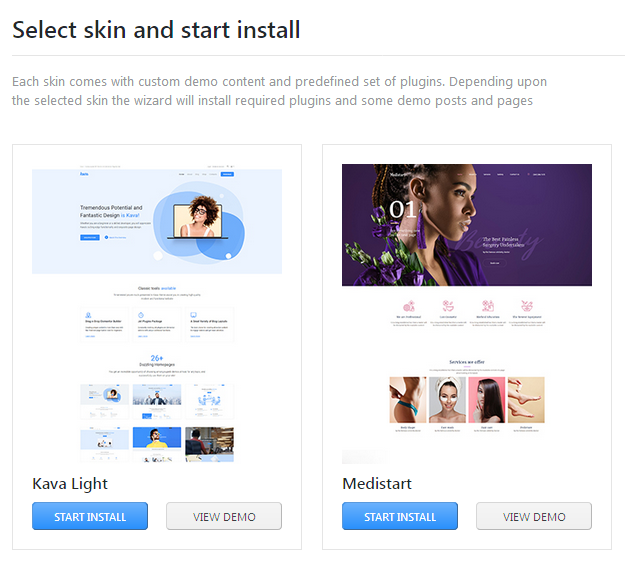 On the Select skin and start install screen select the demo you want to use on your site. Note, that you can change it later anytime you want. You can view the list of recommended plugins for each of demos in the Recommended Plugins listed on the right of each of the demos. In order to view the demo before you make a decision to install it click View Demo button on the right of the demo you selected. The preview page will open. Here you can see how the demo will look on your site. Click Start Install button in order to proceed with demo installation. This block shows the entire process of manual Jet plugins installation in the case you don’t need to install Kava theme or demo content. First, let’s navigate to your Personal Account page on CrocoBlock. Here open Downloads tab. In the Plugins block you can find all the plugins available for downloading. 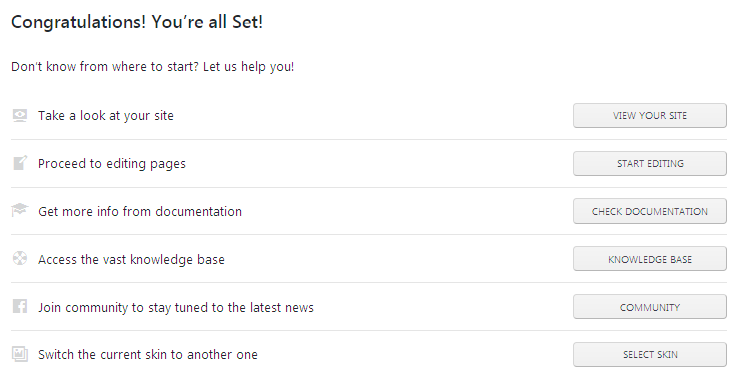 Here you can also view the plugin versions, the short descriptions for each of them. Click Download link on the right of the plugin in order to download it. The plugin will be automatically downloaded into your downloads folder. You can install the plugins both manually using WordPress Dashboard or using FTP. This block will give you information on how to install Jet plugins to Your website manually. First, make sure that you’ve installed and activated Elementor page builder before proceeding to JetElements installation. If you have problems with installing Elementor feel free to read the detailed Elementor documentation. Click Add new button to upload Jet plugins from Your hard drive. Click Upload button, which can be found at the top of Plugins page. Browse the path to Jet plugins and start installation. When Jet plugins are uploaded and installed you’ll need to activate it. 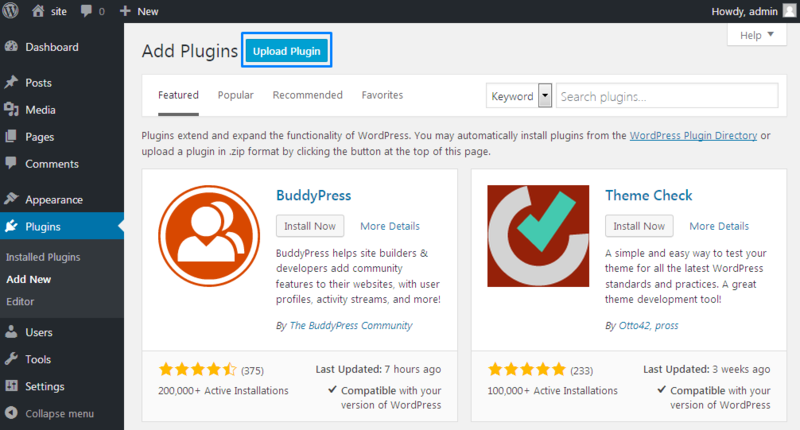 Navigate to Plugins tab and locate the needed plugins in the list of installed plugins. Click on Activate link under the plugins. As a result the plugin will become active. 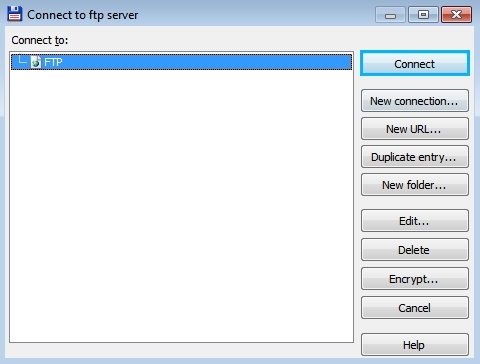 First, let’s establish an FTP connection using any FTP client that is convenient for you (Total Commander, Filezilla, etc.). Locate wp-content/plugins directory in the WordPress root folder and upload the folder containing all plugin files to it. 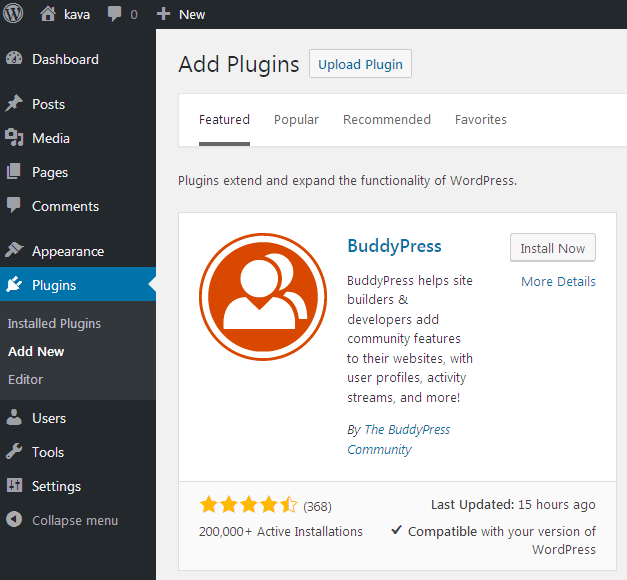 Now you need to log in to WordPress Dashboard and navigate to Plugins > Installed Plugins tab in the left column. Search for the new plugins you’ve recently uploaded and click on Activate option under the plugin title in order to activate them. As a result, the plugins will become active.